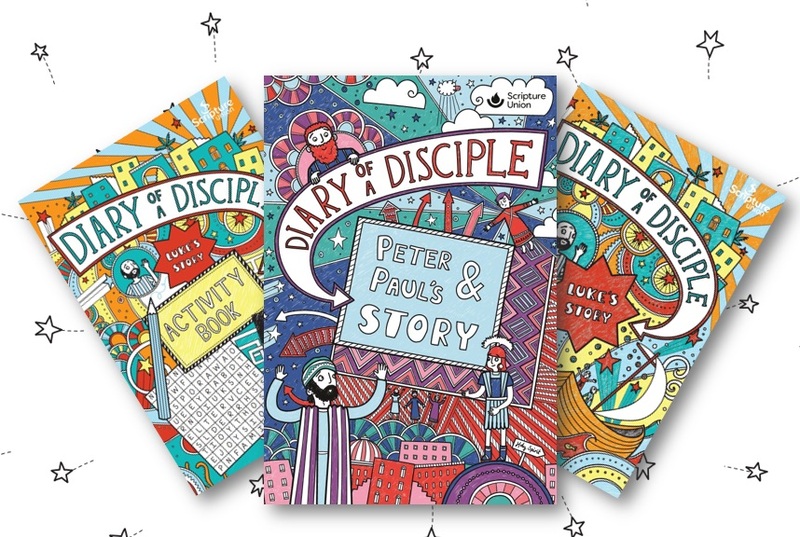 Kids ages 8-12 will discover the bright characters and events of the Bible like never before with this pack of fun Diary of a Disciple books. "Good Evening, and a very warm welcome to my marvellous story"
Fresh from the fizzling imagination of Gemma Willis comes a whole new way of seeing the story of Luke. Part doctor, part detective, all disciple. Every page of this book bursts with doodles, drawings, and discovery. Booming angels, swirling baptisms in great rivers, storms and seeds and stories of impossible miracles. It's all here to read. It's all here in Luke's story as this doctor-turned-detective sniffs out the source of all these incredible events and miracles. Starting with an impossible birth, and ending with the stunning twist of a dead man coming back to life, Luke's diary needs reading to be believed. Friendly and fun-filled, this ever-quirky Diary of a Disciple is perfect for 8-11 year olds. It brings the Gospel to a whole new generation looking for exciting stories to dive into. So get comfy in your favourite chair (the one you spilt your drink one, but didn't tell anyone about! ), open up this exciting book, and be wowed at all the amazing things that really happened. "Well, hello there. How very wonderful to see you, my friend. I don't know if we've met before, but in a way that doesn't really matter because I'm meeting you now!" Doctor Luke is back! And he's got a brand new diary filled with even more amazing adventures. From sheep falling from the sky, to storms, shipwrecks, and prisons. It's all proper exciting! Right after Jesus went back to heaven, leaving his disciples starting like fish at the sky, Luke goes back to Jerusalem and meets from frankly amazing people. From Peter, who's sort of like the boss of the group, to Paul who went from being an angry Christian-hater to the most excited Jesus-follower of all time. And that's where the fun begins. Discover the dazzling and dangerous stories of what happens when these men travel all over the place, telling every kind of man, woman, and child about Jesus. Written with doodles and drawings galore, this next chapter in the Diary of a Disciple series is a fresh, and fizzling as the first! The perfect way to get 8-12s excited about the amazing stories in God's word. Luke's story, like you've never seen before! Get stuck into the brilliant story of Luke - a Doctor who sees amazing miracles, a disciple who follows Jesus wherever he goes, and a doodler whose tale is like no other. Filled with puzzling puzzles and miraculous miracles, Luke's story is made to amaze! From heaving storms to seething Pharisees, Luke follows Jesus through it all, and discovers some amazing things along the way. And guess what? They're all here, waiting for you to colour, solve, and learn from! The perfect present for rainy days and Sunday School games, the Diary of a Disciple Activity book builds on the series that is fast becoming one of the most popular Bible Story collections to date. Perfect for ages 8-11, this activity books speaks in a fresh, new way, and is sure to spark the imaginations and interests of children. So break out those thinking caps, and sharpen those coloured pencils, because it's time, once again, to dive head-first once again into the exciting world of the Diary of a Disciple. Diary of a Disciple ultimate bundle by Gemma Willis was published by Eden bundles in November 2017 and is our 2973rd best seller. The ISBN for Diary of a Disciple ultimate bundle is EDENBUNDLE-2026. Be the first to review Diary of a Disciple ultimate bundle! Got a question? No problem! Just click here to ask us about Diary of a Disciple ultimate bundle. Hi , Can I just ask if these books are hardback or paperback. Many Thanks , Gillian. A:The activity book is paperback, the two story-books are hardback. Thank you for using the Q&A Forum.